Throughout her work, British artist Jodie Carey has concerned herself with the complex dynamic between remembering and letting go. Carey's works represent a bid to trace the idea of mortality while simultaneously setting it against a moment of retaining. The result is an obscuring of the lines that usually divide documentary- archive and poetic, narrative elements. In the case of Carey's works, these two seemingly opposed methods of recording are carefully woven together. The question of material sits at the core of Carey's work. The artist uses materials that are at times mundane - dust or cigarette ash - while at other times loaded with symbolic meaning; blood or bone fragments. These materials, however, consistently transcend the level of pure materiality: Carey is interested in materials that derive from the actual object or moment that she is concerned with. Using this approach, Carey attempts to create authentic moments of memorialisation. Much like religious relics, the artist's works are not merely a symbolic representation but rather the repository of a material essence. In this duality, we see the reinforcement of a remembering that is so typical of Carey's work. But Carey's works never function as mere replacements for that which is disappearing. They refrain from being static memorials or pure aesthetic representations of what has been lost. The works are deeply melancholic, referencing an emptiness and a loss. The artist thus moulds her work into being a visible sign for this underlying mortality rather than shrouding its ubiquity. With this approach, Carey renders the realm of the lost an invisible and intangible part of her work. The artist's aspiration to find an appropriate presentation of the material reflects our own quest for a meaningful - perhaps even dignified - treatment of those moments and objects that we strive to secure in our own memory. the artist offers a complex reading of the particular atmosphere of the Theatre and her own work. the cultural history of the city. Initially opened as part of the royal school of veterinary medicine, the Theatre was later subsumed into Humboldt's faculty of veterinary medicine. From this point on, it served as a locus of university teaching and research. Between 2005 and 2012, the building underwent an exemplary renovation. 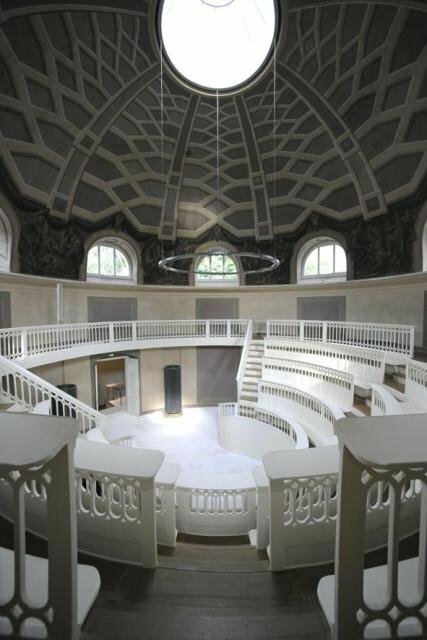 Today, the Veterinary Anatomical Theatre is used by the Hermann von Helmholtz-Zentrum für Kulturtechnik - part of Humboldt University. Shroud is the first contemporary art show in the building's history. no longer accessible. It is a bid made taking into consideration the prolific history of the site. Delicately laid across the floor of the space, the finely ground bones function as a subtle reference to this rich past and through this the artist infuses the space with a moment of remembering, a moment of holding on. Yet ultimately Carey's work expands beyond its immediate, concrete context to develop a narrative about the historical reach of a location in overall terms. and interpretation on the other. With Shroud, Jodie Carey has created a work that seizes upon her subject matter at a site that - like no other - lends itself to her narrative. Shroud is thus a work that underscores the questions that have left their imprint on both the site and the artist herself.